Zappetite is a recent addition to the slimming pill market (non prescription) it is obviously an appetite suppressant and claims to dramatically reduce or Zapp your appetite. 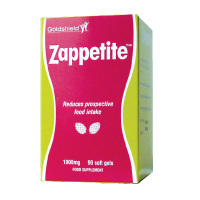 Zappetite is produced and sold through Goldshield, the company responsible for Lipobind and Appesat so as far as credentials are concerned there is not too much to worry about. Goldshield are one of the most prolific UK weight loss producers and have a solid reputation. Company reputation aside – what about this particular product? Zappetite is extracted from a natural plant source much like other appetite suppressing natural products such as Hoodia Gordonii and Caralluma Burn. It is based on pine nut oil derived from the nuts of the native Korean pine tree (which contain about 40 times more pinolenic acid than, for example, Italian pine nuts). Pine nuts have been consumed by humans for centuries and Zappetite harnesses their benefits in the form of a triglyceride capsule. Highly unlikely to cause any side effects. As this is a new addition to the industry it too early to say with any great authority – customer feedback and positive success stories and testimonials are few and far between. Whether Zappetite can compete with the history and effect of Hoodia Gordonii remains to be seen.